Every two weeks we publish posts with our review on books, artists, creativity, photography & the travel guides around Scotland and the world. SUBSCRIBE to receive our newsletter updates and free downloads! Yay! We’re happy to have you on board exploring all things creative together! I remember when I first started Instagram- it was back in 2014, right at the same time I got my first 35mm film camera and was hooked in the art of taking pictures. I began to explore photography in depth and to me, Instagram has always been a visual diary of my photographic journey, I love going through it and seeing how my photography has changed, and l continue this journey of self-discovery via photography today. Recently I did an online assessment which highlighted my five core strengths (pretty accurately, to my own surprise). ‘Learning’ was on the second place, the skill of constantly being hungry for the new information and figuring out how things work has somehow led me to discover the podcast “Hashtag Authentic” by Sara Tasker and then Sara published her first book under the same title. I love beautiful, tangible objects such as books & art prints as it holds the special energy of the maker’s input. I’ve met Sara at the book launch event in Edinburgh where she was recording a live podcast episode and signed books together with her 5-year-old daughter Orla. 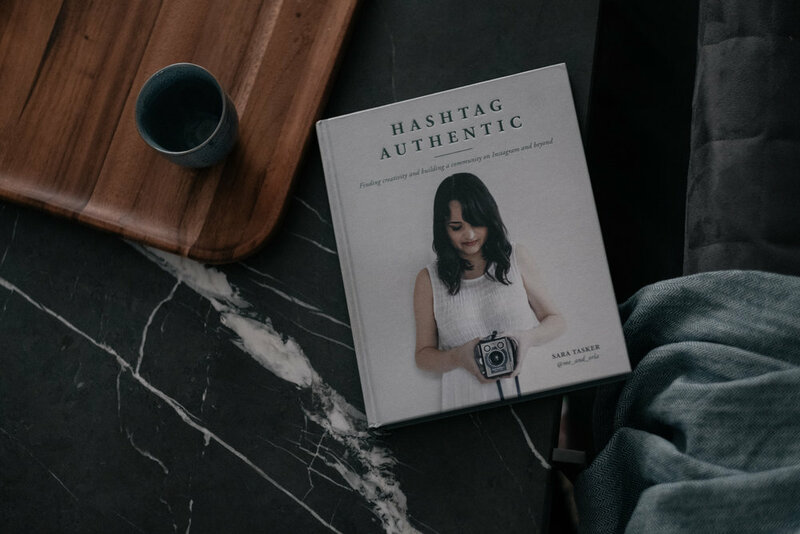 Sara’s story how a mobile app such as Instagram has changed her career from a day job in NHS to a writer, photographer and the business coach is quite remarkable and yet there she was - signing the books with her family beside her. 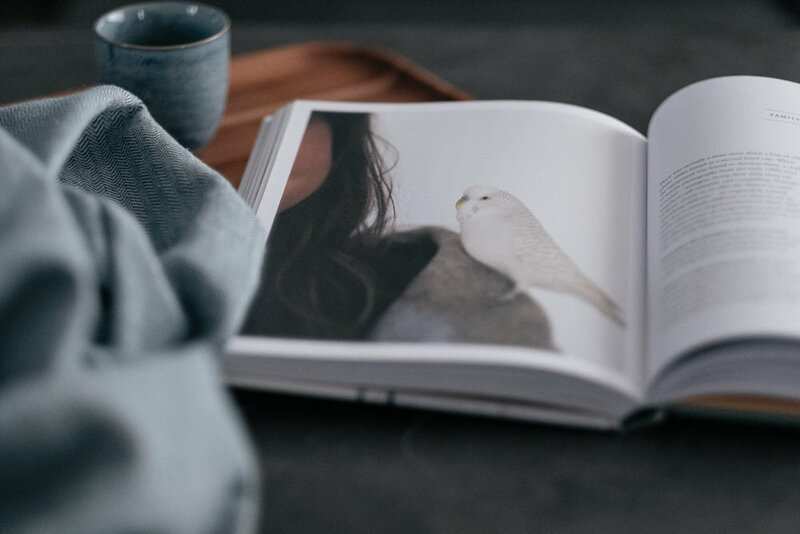 As much as it is a guide to photography and sharing your world on Instagram, this book encourages you to pursue your creativity and take up space in the world with your story. Although I thought I was quite good at keeping a visual record of everyday moments and discoveries, yet what stroke me with the realisation that I’ve been avoiding taking pictures in our house - a place where I spend most of the time in my everyday life. And I know why it’s been the case - while we’re in the process of renovating the house the reality doesn’t seem to be the most inviting nor photogenic as we live surrounded by boxes and tools. However, the truth is that I still have little clutter-free zones where I do spend most of my time to enjoy a cup of tea or coffee in order to rest my eyes from the screen. I took it as a challenge and photographed that moment while I was reading this book. During the process of photographing I realised that I don’t want to keep the record of the surrounding clutter but instead, to celebrate and the smallest moments I get to enjoy while we’re building our home. Undoubtedly, the composition is the key aspect in telling a story in any visual application being it a drawing, a video or a photograph. I personally find it to be the most interesting yet challenging part of the picture taking process. This book explores the topic thoroughly with the exercises and suggestions on what to photograph and how to analyse the image as well as illustrating the 12 rules of composition, how to approach the light and create a mood and an atmosphere in the image. That’s mainly applicable to Instagram rather than any other visual platform. I personally spent a lot of time on Instagram as that’s my favourite place to be virtually surrounded by the creatives and makers alike. I often find browsing hashtags quite tiring experience because great hashtags get quickly exploit by random stuff due to the growing number of users on the app. To me, reading this section of the book was like breathing some fresh air, It’s divided into 11 chapters based on different themes and Sara suggests a few hashtags to explore for each of them. This resonated with me so much. I’ve noticed the online tendency that marketers seem to advocate for to post daily on social media and weekly on the blog. When I lived and worked in central London, I was taking many pictures during the lunchtime strolls and used to post daily on Instagram. But now, since we moved up North to Scotland and chose to live slower life it also made sense to share not necessarily less often but rather make more intentional choices based on my experiences that are worth sharing both on my social media and here on the blog. This is my biggest struggle. If the process of taking the images and then sharing it with the world lifts me up with the joy and curiosity, then writing a text in any shape or form is the complete opposite to me. There were so many moments when I wanted to share a picture but because I had no idea what to say about it I’d leave the idea of sharing it altogether. I continue to have a writing block and this chapter of the book was definitely the biggest takeaway. It helped me to reshape the approach to writing and be less afraid of being vulnerable about it.